We’ve been on our business adventure for over half a year now and it’s been fabulous! We started This Material Culture out of a bit of a crappy situation. I got ill, with horrible, awful depression, and I had to quit my job. It wasn’t working that was the problem, I’ve had a job since I was 14, it was actually going to work and being in the situation that I couldn’t cope with. Instead of sitting at home in my pyjamas and feeling rubbish I decided to do something awesome. I started painting again, for the first time since my A Levels, I bought some Hama beads and made cute coasters, I knitted a blanket. I rediscovered my creativity and then I made some jewellery. People really loved this jewellery, it was unique, stuff you couldn’t buy on the high street. I had a look and a bit of a research and realised that fun, quirky, individual jewellery was in short supply. So we started a jewellery business. We wanted our business to be about people. We live in Liverpool, and personality is something that our city has in buckets. You can buy phone covers, tshirts, cushions with your favourite disney film, obscure indie band or cult TV series on, but not jewellery. We wanted to let people wear the things they love in their jewellery. I went on a few business courses, we talked to friends and family about our ideas and we started to make a hell of a lot of jewellery. We developed the logo, the packaging, the designs – everything that is This Material Culture was fuelled by cups of tea, two best friends and ideas at 3am scribbled on receipts. Early on in our adventure we realised that there was no point trying to make personality driven jewellery without talking to people. 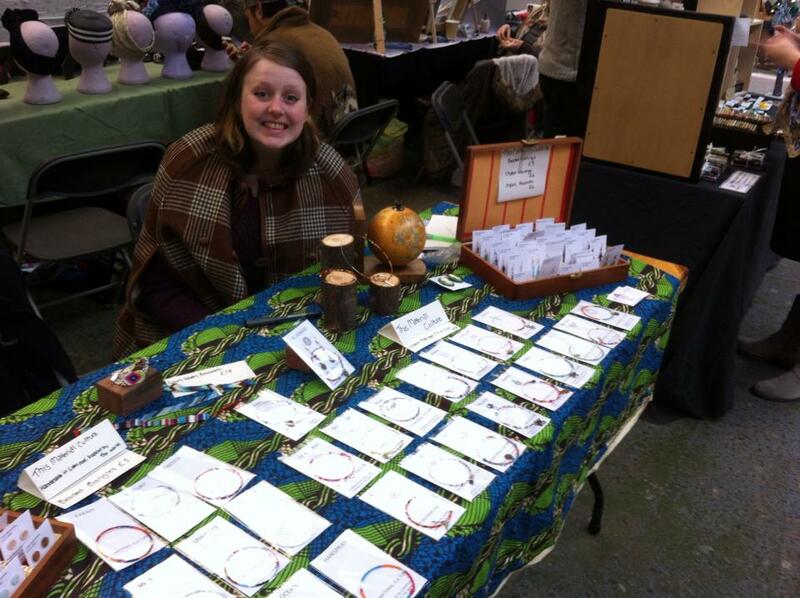 We started selling our pieces at local craft fairs, and instead of making lots of money (we didn’t!) we had loads and loads and loads of conversations. We talked to people about their favourite animals, we looked at photos of people’s pets, we talked about their favourite TV characters, we talked about their childhood button obsessions. We listened to people’s stories and we created new designs that were inspired by the people we met and the stories they told us. Our pieces sparked memories, conversations and inspirations and we love it. In a warehouse at the edge of town, with no heating (hence the cape), handwritten signs and a less polished set up!